Barack Obama’s Supreme Court nominee has had a friendly relationship with labor regulators at the expense of business. D.C. Circuit Court of Appeals Chief Justice Merrick Garland has a history of showing deference to federal labor regulators in reviewing unfair labor practice charges against employers. An analysis conducted by OnLabor found that Garland ruled in favor of the National Labor Relations Board (NLRB), a top federal labor arbiter, in 18 of 22 appeals that appeared before his court. Garland granted the agency leeway in interpreting its regulatory approach and interpretation of its mission. "Judge Garland wrote the majority opinion in 22 cases involving appeals of NLRB decisions. In all but four, Judge Garland upheld the entirety of the NLRB’s decision finding that an employer had committed unfair labor practices," ONLabor said in a blog post. "This deference to the NLRB has had favorable consequences for labor and unions." Labor unions welcomed President Obama’s nominee. AFL-CIO President Richard Trumka called on Senate Republicans to confirm Garland quickly, citing his "impeccable credentials and deeper experience." "Judge Garland’s career shows a deep commitment to public service and to the rule of law," Trumka said in a release. "Judge Garland is a superbly qualified nominee who deserves prompt consideration and confirmation by the United States Senate. Working people deserve and expect no less." The NLRB serves as the nation’s top arbiter of labor disputes at the federal level and is designed to help employers, unions, and workers settle conflict outside of the judicial system. Cases begin at the local level and can be appealed all the way to the Washington, D.C.-based five-member board. Parties then have the option of appealing to their local circuit court or the D.C. Circuit. OnLabor said Garland’s track record shows that he is generally deferential to all regulators, but noted that many of his rulings indicate a pro-union approach to labor law. In the four cases when he ruled against the NLRB he demonstrated "an outlook that is generally favorable to union activity." "In two of these four cases, for example—Carpenters and Millwrights, Local Union 2471 v. N.L.R.B., 481 F.3d 804 (D.C. Cir. 2007) and Guard Publishing Co. v. N.L.R.B, 571 3.d 53 (D.C. Cir. 2009)—Judge Garland upheld the aspects of the NLRB’s decisions that were favorable to the union involved, and overturned only the part of the NLRB’s decision in each case that was favorable to the employer," OnLabor found. Steve Bernstein, a labor attorney with Fisher & Phillips, said that Garland’s track record falls in line with the ideology President Obama has sought in other nominations. "During Judge Garland’s 19-year tenure on the D.C. Circuit, he has developed a track record of authoring decisions that are consistently deferential to the NLRB," Bernstein said in an email. "If Judge Garland is appointed to the Supreme Court, we can certainly expect him to continue to be highly deferential to the federal agencies in their exercise of administrative authority." 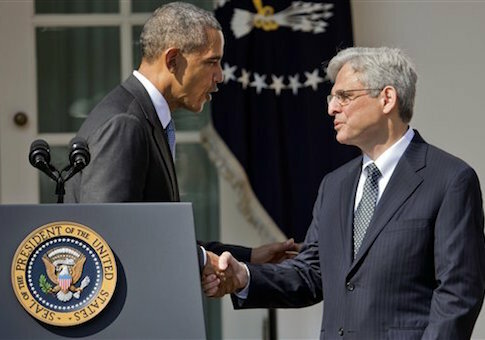 Obama nominated Garland to replace conservative Justice Antonin Scalia on Wednesday. Senate Republicans have vowed to block any nomination to the court before the November election. This entry was posted in Issues and tagged Supreme Court, Unions. Bookmark the permalink.